Lu has this certain comfort feel that each diner gets in every visit. My friend T even considers Lu to be her second home. Aside from the fact that she's friends with the owners of Lu, the servers themselves already know her favorite dishes and would immediately know what to serve for dessert. My first visit was during the WaterPlus launch where we were treated to a healthy four-course dinner that has kept me gushing how delicious everything was even days after. Dinner began with Courgette Flower Crisp with Roasted Bacon and Basil Birch. While the name may sound a bit intimidating and confusing, simply put, it is deep fried Zucchini Blossoms placed on top of crispy bacon and served with a shot glass of miso soup-like sauce. It gives a very Japanese feel to the meal which Paul and I love. Up next was some Caramelized Grilled Pork and Rice Noodle Salad. From the Japanese-inspired starter, we had a Vietnamese feel with the refreshing cold noodles topped with sweet grilled pork. At first glance, I initially thought that this salad would be dry however as soon as I took the first bite I enjoyed the mild sweet-sour sauce with the crunchy nuts sprinkled on top of the salad. Main course was the best : Sweet and Sour Tamarind Prawns with Green Mango Fried Rice. Normally, restaurant would scrimp on prawns given that it's very expensive in the market. Not with Lu, here we enjoyed three huge juicy prawns with a generous serving of green mango fried rice. The rice was not very oily and it has that just right tangy taste in contrast to the soy sauce added into it. It reminded us of our Bangkok trip as we enjoyed a lot of Bagoong Rice and Tamarind-infused dishes then. For dessert, it was our native ingredients that stood out -- Pandan Bukayo (shredded and sweetened coconut) with Ginger Ice Cream. Upon learning that our vanilla ice cream has ginger in it, I proceeded with caution. Taking a small scoop I allowed the ice cream to melt in my mouth to be able to appreciate the full flavors of vanilla mixed with ginger. I'm glad that the ginger wasn't too overwhelming and you have to eat it with the sweet pandan bukayo as the combination between the ginger ice cream and the sweet bukayo was simply heavenly. 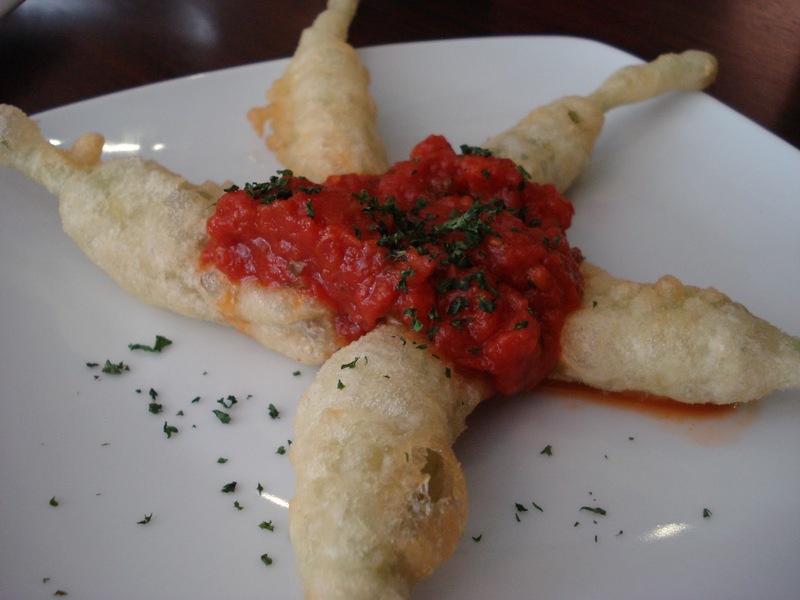 Hats off to the Chef who was so creative in preparing our dinner. A couple of days after, I was invited by my friend T to have lunch at Lu. After enjoying my first dinner there, I immediately said yes, dropping all of my to-dos for a few hours. Since T has been to Lu countless times, I left the ordering up to her. T makes the best choices and our lunch that day was truly delicious. Crispy prawn and shiitake spring rolls + Vietnamese rice rolls with Curried Chicken -- this is a duo of all delicious things! I love having spring rolls as starters. They're really fun to eat and I really enjoy the little surprise that I get on my first bite. between the two, I enjoyed the Vietnamese rice rolls more as having the spicy chicken inside gave a nice twist to the usual Vietnamese rice rolls with veggies and meat inside. Lu Ultimate Pork Chop with Tangy Orange-Achuete Sauce -- We went there to enjoy meat and for our main course, we ordered all the meaty goodness of Lu. First was T's personal favorite, the pork chop which was very tender and so easy to cut into. 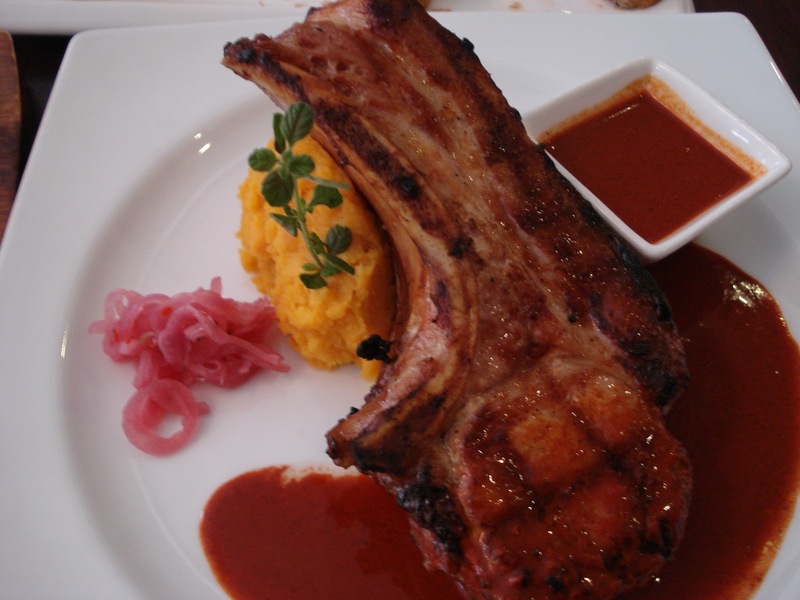 I love the mash sweet potatoes also as it gives a sweet touch to the grilled barbecue taste of the pork chop. 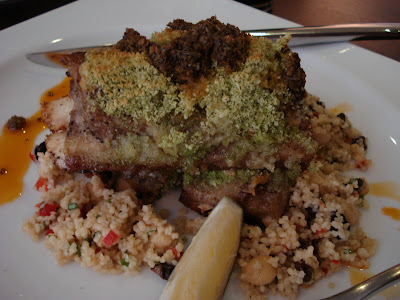 Herb-crusted Lamb Spare Ribs -- I love lamb and if you add more flavorful herbs into it, I am in food heaven. I love that it came with couscous giving a good balance to this dish. I just couldn't identify what were the herbs added on top of the lamb but whatever it was, I enjoyed adding it to my every bite. Mexican Steak Frites -- We had pork, lamb and this time juicy and melt-in-your-mouth steak. It was served on a wooden platter with veggies at the center surrounded by Arrachera Hanger Steak cooked will Caramelized Onions and Melted Cheese. 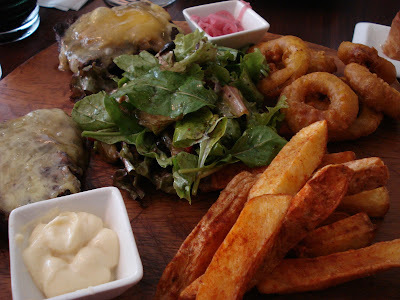 As sidings, we had Onion Rings and Chunky Fries. Every bite was just so delicious and I also enjoyed the crunchy onion rings dipped into their special creamy sauce. It gives a very Southern American feel as I imagine enjoying this in a ranch while overlooking the vast fields. We had a very filling delicious lunch but Lu was not yet done. Out came our dessert: Lemon glazed yogurt cheesecake. 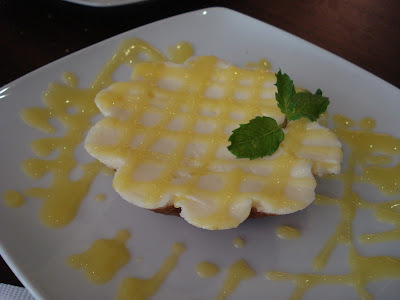 The Lemon Glazed Yogurt Cheesecake was my personal favorite. I love citrusy and fruity desserts and the fact that this one was made with yogurt gave me the impression that it's healthier than your average cheesecake. Each slice will give you a smooth yogurt texture and the lemon drizzle on top has the right amount of citrusy flavor that even the little ones will surely enjoy. I can't believe it took me a while to finally visit Lu. I enjoyed my meal on both visits and my friend T was right, it can really be ones 2nd home as you can unwind while enjoying great food and wonderful company. waaahhh..gusto kg cheesecake na yan!